My father used to point out that historical dramas on TV always got one thing wrong. When horses were shown pulling carriages along unfinished roads, there would be just two tracks. That's not how it used to be. In the past, there would be a third track in the middle created by horses' hooves and a track either side created by the wheels of the carriages. If there are just two tracks then that is an indication that only powered vehicles normally use that road. Here in Assen in the present day we have three tracks on some residential streets which were not 100% cleared of ice this week. Those either side are made by the infrequent motor vehicles, while the most distinct track is that in the middle, made by the many cyclists who use this route. This shows clearly how streets which people often imagine are "shared" between drivers and cyclists much as they might be "shared" in other countries are often not actually shared equally at all in the Netherlands. Rather, cyclists dominate because segregation of modes can also be achieved without building cycle-paths. It felt a little parky when I took our dog for a walk last night and on returning home I noted that someone had asked me about how we get on cycling in the winter. How cold is it ? What condition are the cycle-paths in ? I decided I'd take some photos today and write a little about this (again). On return from the dog walk I noted that the outside temperature was a little below -11 C. For most of the week beforehand the temperature had been hovering around -5 C at mid-day and as I write this it's about -6 C. It'll get colder overnight. We've not had masses of snow compared with previous years. About 17 cm of snow (7 inches) fell on Monday. It kept falling all day and though I swept our driveway twice, it didn't much look like I'd bothered by Tuesday. Simultaneous green crossing in winter. I stopped for red. During Monday things were a bit difficult because even the most effective of treatments for roads can't deal with snow which continues to fall. However, as soon as it stops the local government does a very good job of sweeping the paths and treating with what appears to be a mixture of salt and sand. Main cycle-paths are treated immediately, as are main roads. Residential streets are treated last. Where cars have been they compress the snow and this is more difficult to remove so conditions on some of these streets can remain unpleasant. The photo on the left of a snow-plough going along our street shows how it can be. This was his second pass within 10 minutes. The gritters are switched on and off by computers using GPS. Therefore, they don't waste excessive salt where it's not needed but achieve an even spread around the city, wherever the driver happens to go. Without this, in the past, the area around the depot tended to be treated better than outlying areas. Last Saturday, the 29th of December, was the day of the Oliebollentocht. This is an annual social ride for velomobilists, around 60 km in length. 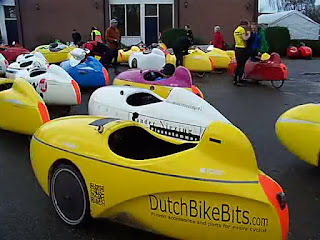 This year it the circular route started from Zwolle and it attracted 157 velomobiles which was enough for a new world record. 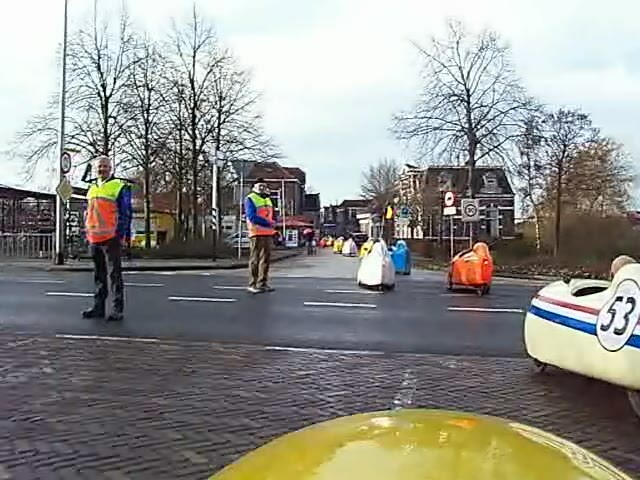 157 is about 1/10th of the total number of velomobiles in the Netherlands, though quite a lot of participants were not from the Netherlands but from Germany, Belgium and France. One guy rode his velomobile all the way from Austria to take part. I started making a video, but several other people made better videos than mine. I've picked out two of them. Zwolle is 70 km South from Assen, I rode there on my own on the morning of the ride and rode back again afterwards with Peter. 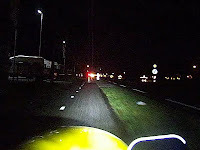 Quite a lot of the riding was in darkness at both ends of the day, and I again supplemented my inbuilt B+M light with a Philips headlight which lit up the road very well indeed. Roughly half of the total distance was covered on cycle-paths, and the other half on minor country roads which mostly don't function as through roads for drivers. By the end of the day I'd covered a total of 202 km at an average speed of 27.5 km/h, including all the slow-downs which occur when riding in a large group, wheeling the Mango through parking areas, slowing down and stopping to read the map on the way there and back etc. Such an average doesn't break any records, but it's a perfectly respectable touring speed and as I've pointed out before, providing another example how it's perfectly possible to keep up a good speed on Dutch cycle-paths. The entire day was a pleasure, and as ever, the infrastructure helped to make it so. Where else in the world could such a mass ride take place with a lot of people riding rather larger than average bicycles, often two abreast, at a good speed, with no problems due to motor vehicles ? 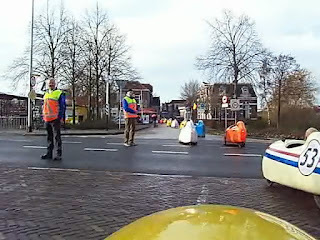 Finally, thank-you to all those involved with organising the Oliebollentocht, especially Paulus den Boer who hosted the event and the many volunteer verkeersregelaars who gave up a day to direct traffic and by doing so made things go very smoothly indeed. How efficient is it ? I calculated a while back that a strong person doing a manual job probably generates about 1 kWh of energy in an eight hour working day. I cycled for less than eight hours, so this journey was probably made on less than 1 kWh of energy. 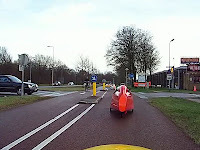 It's remarkable how efficient cycling is, and a velomobile is even more efficient than a normal bicycle.